Karl Lagerfeld, Stella McCartney, Anna Wintour... Lewis Hamilton has met all the fashionistas who matter. 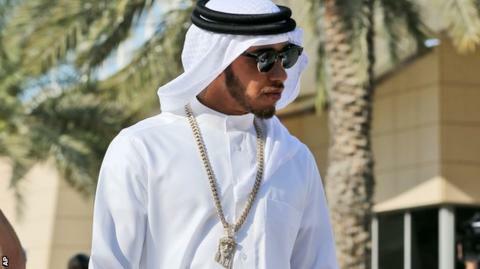 So when he arrived for the Bahrain Grand Prix in a traditional local dress, it was perhaps no surprise that he managed to pull it off. But he's not the first. Oh no - Lewis follows a rich tradition. Formula 1 and style statements go together just fabulously, as we can demonstrate in this stunning parade of racers. Here comes Ayrton's great rival, Alain Prost. The woolly jumper-bright red salopette combo says: "I'm going ski-ing with the family and I'm quite care-free about the whole thing"